We spent a full day in Illinois, driving from Hannibal, Missouri to Calamus, Iowa. The farmland is green with the corn crop growing, and the recent rains have kept them green. However, the farmers are concerned about the sogginess of the soil. It needs to drain soon for the crops in the fields to do well. This should be on a postcard. We left a day early from Mark Twain State Park. Our camp hosting gig was finished and the new hosts were expected the next day. We had a wonderful time working with experienced camp hosts, Bev and Joe and the gracious and courteous staff. We would love to return someday. However, the rains kept coming and the water kept rising and on occasion, the wind blew in circles calling for emergency preparedness to be put into practice. Fortunately no one was hurt and little damage other than a tree limb or two being blown down. 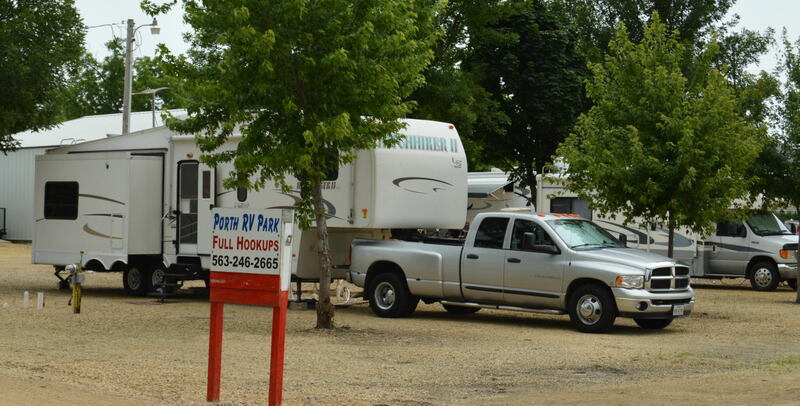 We spent two nights in Calamus at Porth RV Park. We found the small town (population less than 400), to be delightful. The Steffan’s Tavern serves morning coffee for the early birds, home cooked lunches and supper most days as well as offering alcoholic drinks in the evening. It is more than just a tavern, the food is exceptional. We walked the town in about an hour and were so impressed with the green lush lawns, flowers, and neatness. Miss Cathy was tending her garden and was gracious to show it to us. It had ferns, hostas and day lilies, water features, and lots of whimsy. Our camp owners and hosts, Charley and Karen were generous with their garden fair. They provided us with green onions, squash and the opportunity to pick cherries right off the tree! We pitted the cherries before we left and have enough for a couple of pies, a crisp and made ice cream topping from the rest. Porth RV Park in Calamus, Iowa is a place to return if we are ever in the area. Picking cherries s better with a ladder! Most homes looked just as neat as this. The Rail tracks are busy here day and night and everywhere is close to them. They seem to run every half hour or so. We thought that it might keep us awake at night, but after such a nice walk in the town we slept very well and did not hear a thing after midnight. Seeing products, oil, coal, and supplies being transported up and down the Mississippi River and now the rail cars doing the same, and of course we travel with the semis on the road, makes me appreciate all of the commercial items that are delivered on time to the stores where I shop, the utilities I use and the new cars I use to buy. We have a busy widespread consumer system. Ding-ding the guard gate is down. My Daddy worked for the Missouri Pacific Railroad and I still love hearing the whistle, the clickety-clack on the rails and the whoosh as it flies by full of freight. I love a train! OK Lil sister now you’ve gone and done it! You are making me SO jealous of all this vagabonding, while I am still rising at 0530 and commuting to work. BTW, Calamus is a short (35 miles from the growing up years of our ggrandfather Silas Eben Osburn, who is in the 1850 US census living near Lisbon post office. His parents were our gggrandparents Stephen Douglas Osburn and Charlotte Shintaffer. Silas and family show up in the 1860 US census in Cedar township, Johnson county, IA. These counties and place names have possibly changed, but Lisbon is probably correct. We went through Lisbon. No wonder I felt such a camaraderie with the folks we met in the area, they might have been 4th-cousins! Cedar Rapids is not far, could that have been Cedar Township at one time? We be traveling through North Dakota and Montana in late July, any information on relatives there at one time? BTW, we are having so much fun!!!!! I wish you were along for the ride, you would enjoy our laid back style.